The LiquidBiopsy® Platform simplifies the isolation, enumeration, and molecular analysis of rare cells and cell-free DNA (cfDNA) from whole-blood samples. Achieving high target cell recovery and exceptional purity, the platform enables downstream molecular characterization of rare cells using next-generation sequencing (NGS), FISH and IHC. The automated LiquidBiopsy Platform performs flowcell priming, blood sample loading, target cell isolation, and immunofluorescence labeling (staining) of captured cells on a flow chip with the same form factor and utility as a standard pathology slide. The system includes standard assays as well as customized, user-defined SOPs and capture cocktails. Achieving high target cell recovery and exceptional purity, the platform enables both enumeration and downstream molecular characterization of rare cells. The LiquidBiopsy® Platform’s proprietary sheath flow technology eliminates the need for whole-genome amplification, a process that can introduce false positives in the data. The LiquidBiopsy® Platform achieves up to 100% sensitivity down to <1% mutation frequency at 2,000x read depth and allows for multiplexing samples on the sequencer. 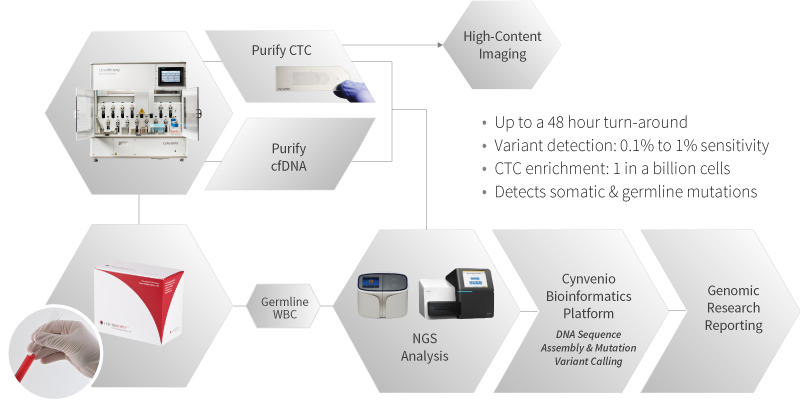 A comprehensive and distributable workflow for ctcDNA, cfDNA and germline sequencing with optional CTC enumeration and highly multiplexed genomic data. Mutation analysis has traditionally been performed only on tissue biopsy material. However, many tumors are difficult to biopsy, are accessible only using fine needle aspirates (producing little usable material), or are located either in unknown sites or in sites that are challenging and risky to access. Radiographic approaches are often insensitive to changes in tumor response, and the recovery of additional biopsy material assumes one can effectively identify the most important section of the disease for analysis. Traditional tumor assessment methods fail to capture the heterogeneity of the disease, especially during progression or resistance. The LiquidBiopsy® can solve these problems. It is a supplementary blood-based biopsy mechanism that samples different parts of the disease from traditional surgical biopsy, has none of the associated side effects or risks to the patient, can be repeated as needed for effective monitoring,and samples the part of the tumor that is associated with informative metastatic events.